"All of Deltek's PSA ERP product lines should be considered by businesses that live and die by their projects. The PSA ERP applications are developed with project management and project accounting at their core…In industries, such as government contracting and engineering and construction (AEC), there are few competitors that can match Deltek's expertise." 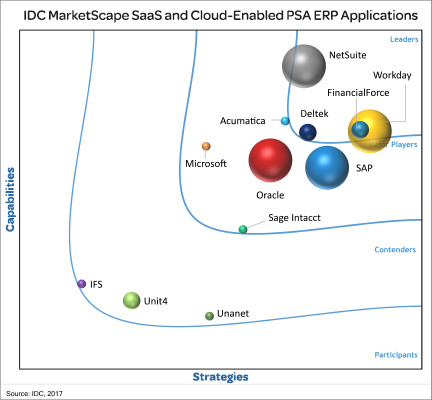 Read an excerpt of the report to learn why the IDC MarketScape names Deltek a leader, and the reasons savvy businesses are moving to cloud PSA ERP. The content for this excerpt was taken directly from IDC MarketScape: Worldwide SaaS and Cloud-Enabled PSA ERP Applications 2017 Vendor Assessment (Doc #US42215717). Mickey North, Jordan Jewell, Kevin Permenter, Eric Newmark.